Heavy doom rock outfit O ZORN! announced earlier this month that drummer Danny Walker has jumped on board to deliver drum duties. Danny Walker is now the new drummer for O ZORN! You may know his name from his stints with Intronaut, Murder Construct, Exhumed, Jesu, Job For A Cowboy, Cloudkicker, Cephalic Carnage & Uphill Battle Danny additionally plays for Groups Phobia & Expulsion. “I’m proud to announce that I am teaming up with Long Beach heavy hitters O ZORN! Their brand of heavy doom rock with a dose of punk energy Is what attracted me to these guys. They blew me away live and I think their music is fantastic and fun. At the moment we are piecing together material for an album. A lot of it is already written, but we are all contributing and I’m doing my best to embellish and bring my own style into this band. We got some shows coming up in March. If you’re interested in hearing what they’ve done in the past there’s an older album up on band camp. Check it out! Add these dudes on social media! Intronaut would like to thank all you amazing people for your continued support of our band over the past decade, and especially with the release of our latest album. You guys are the best fans ever, and we’re lucky to have you! We are very excited to announce our first headlining run of 2016, with support coming from two bands we love. 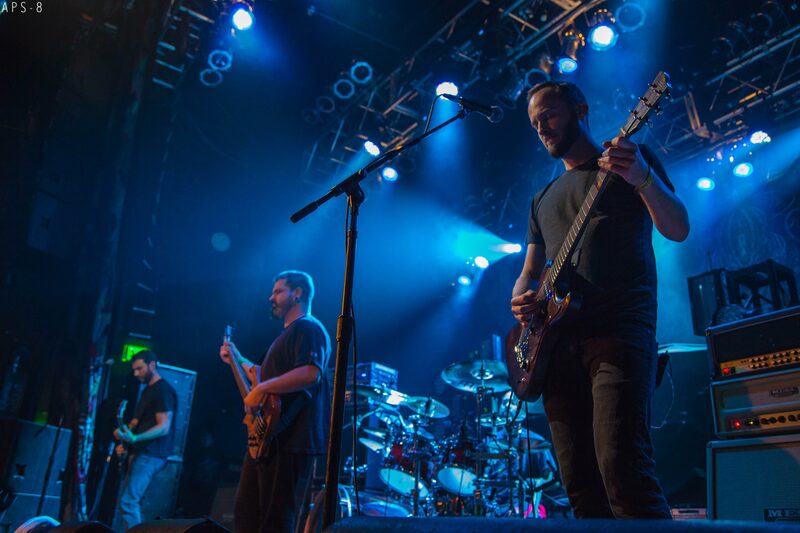 The Ocean are a band that Intronaut has a long history with, as they helped us get our footing in Europe almost a decade ago, and we have played close to 100 shows with them over the years. They are an incredible live force that only gets better every time I see them, and we’re honored to have them do this tour with us. If you’ve never had a chance to witness their show, I highly recommend you not miss them on this tour. North are another band we have known for many years who have a crushing new record coming out this year. There will also be some great locals opening in many of these cities. To give you an idea of our show, we are planning on playing all the songs from “The Direction Of Last Things,” as well as some songs from all our past records. We are also working hard on a beefed-up visual production that should take you from zero to I’m-freaking-out-man in record time. See you all this spring! Los Angeles based post progressive metal band INTRONAUT have begun work on their 5th full length album. The album will be recorded with Josh Newell (Cynic) with Devin Townsend handling the mixing. Named the best metal band by the LA Weekly, INTRONAUT formed in 2004 and have released 4 full length studio albums and two EPs. They’ve toured with Tool, Mastodon, Animals As Leaders, TesseracT and were the backing band for multi-instrumentalist, Cloudkicker on his first and only national tour. A day before entering the studio to record their as-yet-untitled fifth full-length album with producer Josh Newell (Cynic) and Devin Townsend on the mixing console, Intronaut played a 45-minute set here and made it a truly special, exclusive occurrence for attendees. Sandwiched between two older songs that began and ended the set, they presented four brand new tunes in instrumental form, as guitarist/vocalist Sacha Dunable pointed out that the vocals for the new jams hadn’t been worked out yet. The next time they step on a stage they will most likely have vocals on these, so Intronaut fans in the audience genuinely felt fortunate to be able to experience the band’s new material in its purest incarnation. Every time Intronaut convinces listeners that they might have hit their peak as songwriters and performers, they go on and outdo their own previous efforts. The same is the case with their brand new creations which take their progressive tendencies to unchartered extremes, encompassing an incredible degree of diversity within itself, ranging from the heaviest to the most psychedelic. The impact of their music is undoubtedly amplified live which showcases the four members’ expertise on their respective instruments. Sacha Dunable and Dave Timnick hold the forefront on guitars and vocals, meanwhile Danny Walker on drums and Joe Lester on bass (as well as with his endlessly oscillating head) embody the rhythm. Even though they were playing to the backdrop of Meshuggah’s artwork and in front of a crowd that was very much here solely for the headline act, in this writer’s completely honest opinion Intronaut stole this show, and if ever there were to be a scenario where Intronaut and Meshuggah were playing their own separate shows on the same night in town, Intronaut would be chosen within the blink of an eye. Thanks to everyone that came out catch one of these 10 year Anniversary gigs! “We’re taking a break from writing a new record to celebrate our 10th anniversary as a band with this special run of shows. We haven’t finalized a set list yet, but expect at least one song from every release, and maybe a special guest or two to come out and help us play them. 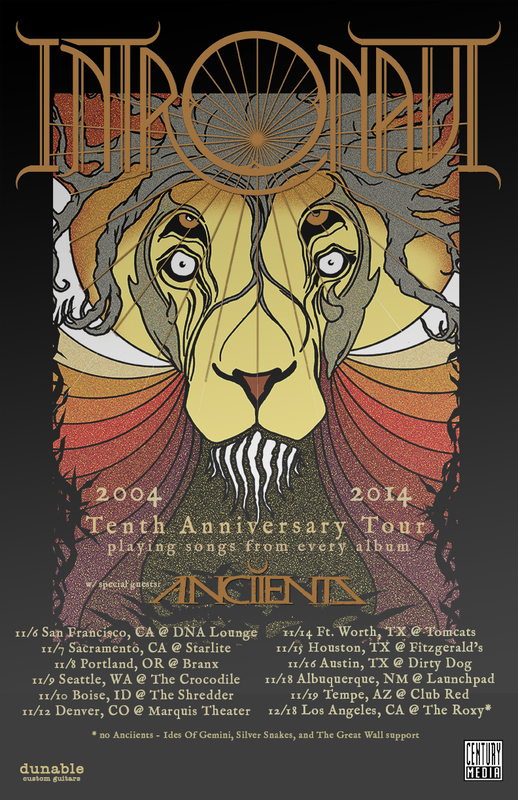 Joining us on these shows will be our Canadian friends Anciients, and the LA show will feature Ides Of Gemini, Silver Snakes, and The Great Wall. “This just happened to be a time when Intronaut was free and, incredibly, I was able to get the entire month of April off from work. We have been in touch since 2010 and they had told me a few times that we could make this happen, but it wasn’t until last fall that I decided to give it an honest effort. Having the professionalism and technical proficiency of a band like Intronaut was the piece of the puzzle that finally encouraged me to pursue this since they are making it so easy for me. I know that when we show up for the first night of the tour everything will be locked in and we can just focus on having a good time. 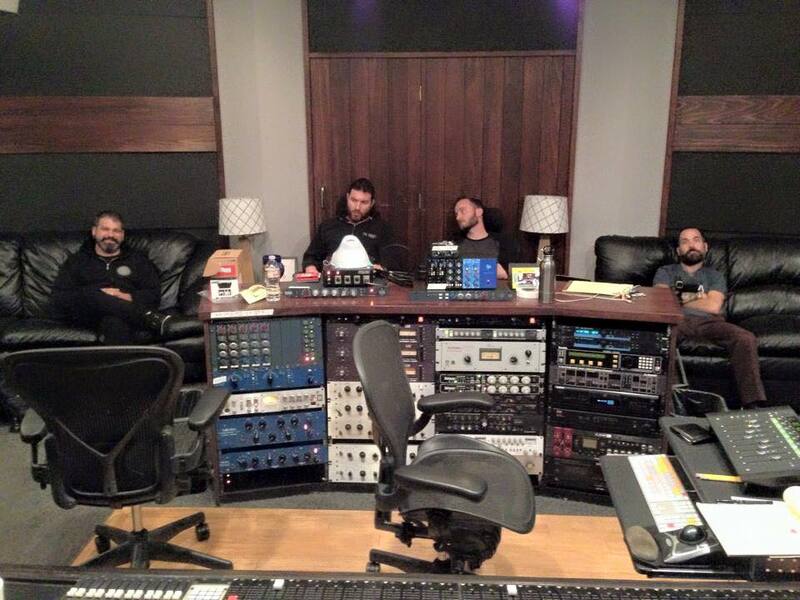 According to the Tumblr of Audiohammer Studios’ producer Eyal Levi, Job for a Cowboy have shown up over the weekend to begin the recording of their upcoming record. Keep in mind the album won’t have former drummer Jon “Charn” Rice (who only recently dropped out of the band), but Intronaut‘s Danny Walker. Walker isn’t a full-fledged member of the band, but a temporary replacement for the recording sessions… or at least that’s the way it is right now. No word on what the band are going to do when it comes time for touring on the new album. Job for a Cowboy have been getting progressively faster and heavier over the years, so I think it’s safe to say that this record has the potential to collapse universes. It helps that the guitar duo of Tony Sannicandro and Al Glassman are unstoppable riff machines and bassist Nick Schendzielos is certifiably out of his mind in every way possible.